The Instant Flanger Mk II brings the great sound of vintage tape flanging to your plug-in toolbox. 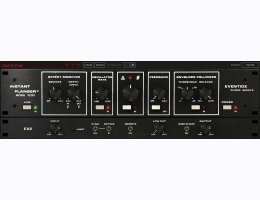 An authentic emulation of the original 1975 studio rackmount, the Instant Flanger was famously used on David Bowie’s "Ashes to Ashes" and Cyndi Lauper’s "Time After Time." A truly versatile tool, engineers and producers have used it for stereo sweetening, subtle modulations, double tracking, and extreme flanging effects. Turn flat mono guitars into huge stereo leads or have your single channel synthesizer fill out the sides of your mix with pseudo stereo. The Instant Flanger Mk II has dual outputs that create three different sonic images - "Shallow", "Deep", and "Wide". Combining “Wide” Mode with the "Low Cut" control is an easy way to place multiple harmonies behind the lead. Fine-tune the resonance of your flanging effect by using the "Depth" and "Feedback" controls. Tape machines use servo motors to run at constant speed and when an engineer pressed a thumb on the flange and then suddenly let go, the capstan motor servo reacts - overshooting and undershooting as it seeks to recover proper speed. In other words, it 'bounces'. The Instant Flanger convincingly mimicked this behavior with its innovative "Bounce" control knob. Use this feature to add a real world groove to your tracks.